If you’re a big sister, you probably know lots of things already. 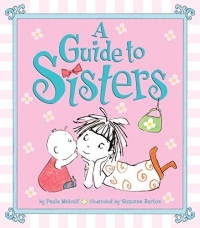 But when it comes to little sisters, every girl could use a few extra tips! This guide covers important topics like “cuteness” (thank goodness she’s the cute one now—what a hassle that was! ), “tickling” (includes handy cutout that details ticklish spots), and “sharing” (one cupcake for her, two for you). It’s the book no sister should be without! I loved this book so much and it fit perfectly with my family since I have three girls. I'm always trying to teach my girls the value of sisters and appreciating your relationship with your siblings from a young age. I loved how the reader gets a simple, yet fun explanation of sisters and how to handle them. Sure, things are a bit more idealized than reality, but there are definitely some truths to baby sisters and how crazy they are. The illustrations were adorable and very appealing to the eyes. They were simple and also helped tell the story. Thoughts from the 10yo: It was so cute and funny. Why can't my little sister be cute like that? Thoughts from the 4yo: I liked when she put her baby sister in with the presents. So funny!